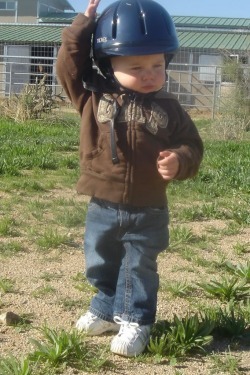 Riding helmets are a MUST if you want your child to ride a pony! NO EXCEPTIONS! form of injury is a head injury; and while a broken arm or leg can heal a broken brain doesn't. Make sure your helmet is SEI certified as meeting the ASTM F1163-90 standard. Shop wisely; not all helmets available pass this safety standard. Always make sure that the helmet is securely strapped and properly fitted! We only stress the use of helmets to ensure the child's safety no matter if they are walking or in a lesson cantering!